Chris Murakami, a Mizzou doctoral student specializing in science education, helps Child Development Lab students plant seeds in the Children's Learning Garden. 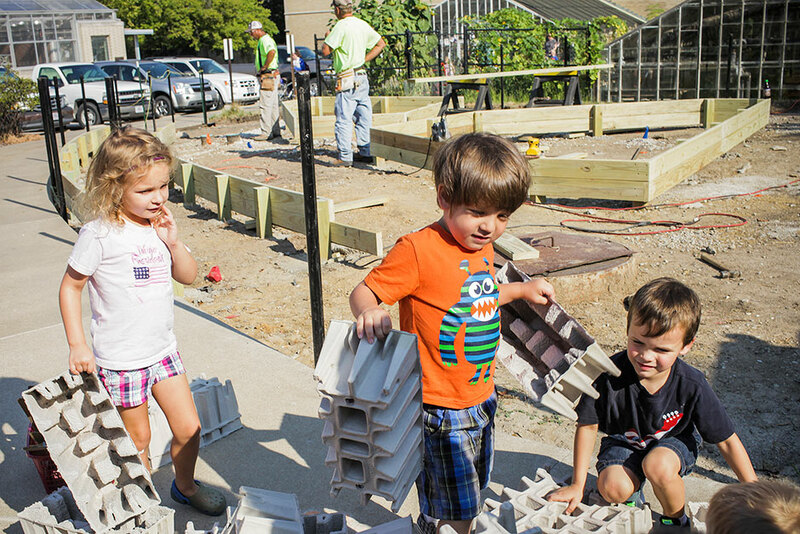 The 80 little sprouts attending the MU Child Development Lab are gaining a working knowledge of growing healthful foods, thanks to a new gardening plot — the MU Children’s Learning Garden — and a partnership with some helpful students and USDA-Agricultural Research Services. Many of the preschoolers already understand the basics of gardening. With a producing garden of their own, they’ll take that knowledge to a new level and share healthful eating tips with their families. The CDL and garden are in the College of Human Environmental Sciences Department of Human Development and Family Studies. MU students and volunteers from the USDA help the youngsters plant and maintain the area, which features several vegetable beds, a sensory garden of herbs and a pollinator garden to attract bees. A spot along the back fence is ready for the future planting of berry bushes, and there’s space as well to add fruit trees. The Children’s Learning Garden is ADA accessible and is open to children of all abilities, with planters that are wheelchair accessible, a raised planting table and free-standing pots. CDL Director Jessie Bradley says connecting children with nature is an exciting national trend that benefits today’s busy parents, who may not have the space or time for gardening with their children. “Bringing the outside in is another way of learning for kids. Children start to understand that you buy food at the grocery store but a garden is where it comes from. Children who experience gardening have a more true picture of how things grow,” she says. 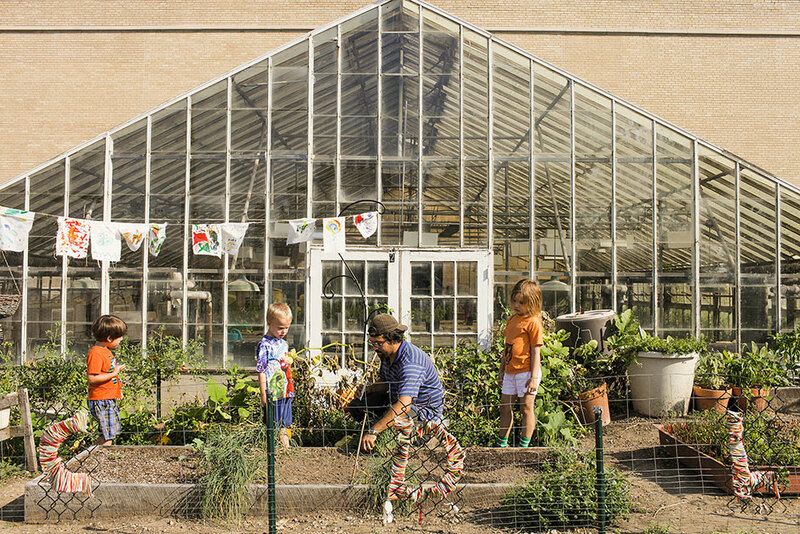 A peaceful spot amid the MU greenhouse neighborhood, the Children’s Learning Garden abuts the USDA-supported People’s Garden and sits just east of CDL facilities in Stanley Hall. The garden, designed by Landscape Services, is a gift of alumna Marlese Gourley and Robert Gourley of Lee’s Summit, Mo. “I’m an old farmer’s daughter, and I think that’s the way you teach children where their food comes from and how to care for the earth. So many children these days have no idea how food is grown. You need to start really young, and these are preschoolers,” Marlese says. Murakami plans exercises for the children attending the CDL to do in the garden once a week. The Children’s Garden functions like an outdoor classroom filled with sensory experiences to explore. Children learn about food through the life cycle of a garden as they participate in preparing the soil, planting, caring for the sprouts and plants, harvesting and observing the decomposing process. “The Children’s Garden blends it all together. We’re getting kids back to eating whole foods, and we’re promoting healthful eating,” Bradley says. The youngsters will use their own garden-produced food to plan menus for classroom meals as a useful lesson in health and nutrition. Teachers expect the food, especially vegetables unfamiliar to the children, to become more appealing to them as they learn simple food preparation and work with recipes. 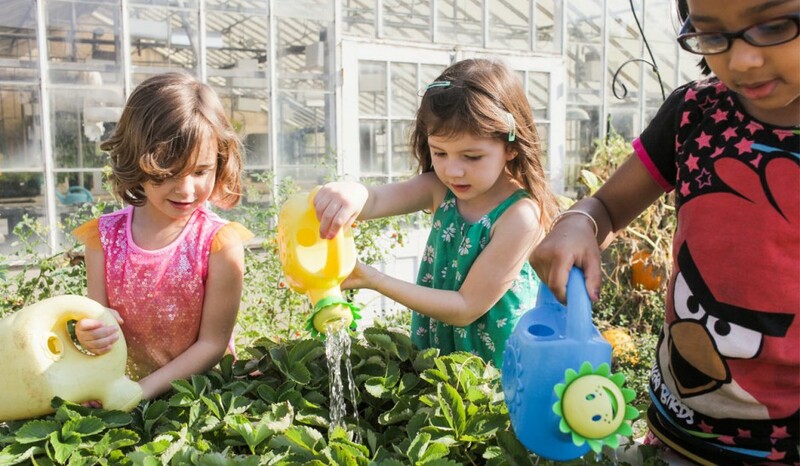 Many gardening-related learning opportunities exist for children as young as 13 or 14 months. Older children can practice their writing skills by creating labels for the plants and can learn elementary mapping while planning what to plant and in which rows. “Perhaps story time will happen in the garden. We may have a garden party and perhaps find a way to partner with Head Start. We will collaborate with the community. Parents can help as well,” Bradley says. 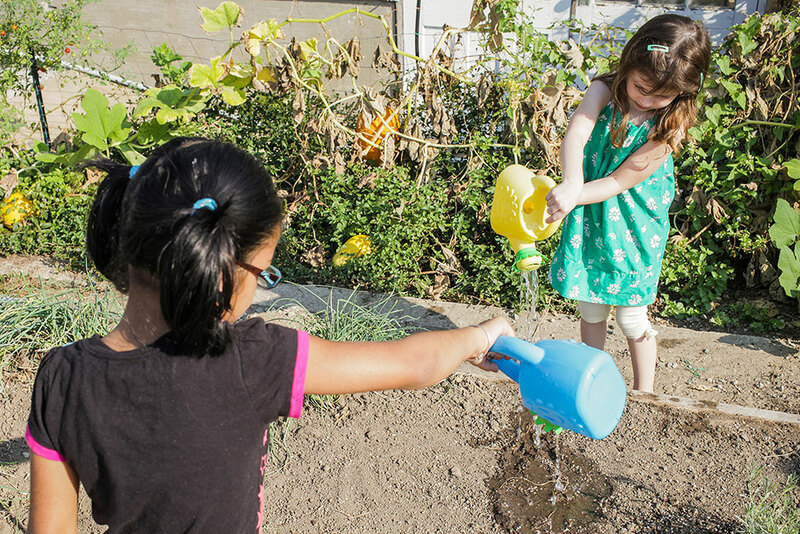 Teachers say the gardening activities enrich a child’s vocabulary with new experiences to talk about. The tots learn colors, shapes, social skills and cooperation. A cob of Indian corn, for example, becomes a lesson in colors and in counting kernels, and when children are asked to pick individual kernels, the activity strengthens small-motor skills. The children of CDL already have a history of cooperative gardening. 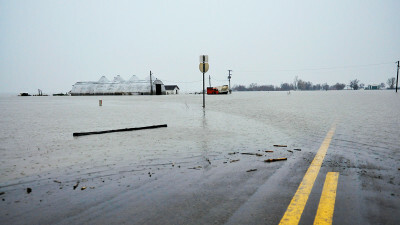 In the past, they have helped plant, water and harvest food for the Columbia People’s Garden, which donates the produce to low-income families through the Food Bank for Central and Northeast Missouri. 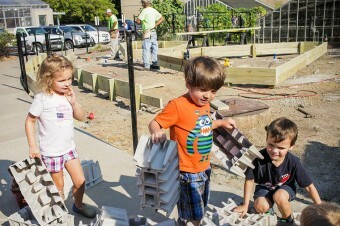 Children work on a building exercise next to the site of the new campus community garden. Murakami designs developmentally appropriate, safe gardening activities that connect CDL’s weekly gardening classes to the preschool curriculum. He encourages teachers to use the seasonally produced vegetables for tasting lessons that allow children to explore foods with all their senses before eating them. “Whenever possible, the children take food back from the garden to taste and make special recipes,” says Murakami, whose focus is science education. After reading Chicks and Salsa, a book about a group of chickens who make a variety of Mexican foods, the prekindergarten kids used Roma tomatoes, onions and garlic they had helped grow to make the salsa recipe from the book. Murakami recently brought a harvest of tomatoes, cucumbers, basil and garlic into the classroom to make a basic cucumber salad. “We tasted the vegetables and herbs by themselves first, then together. Sadly, we ran out of vegetables, and the children wanted more. 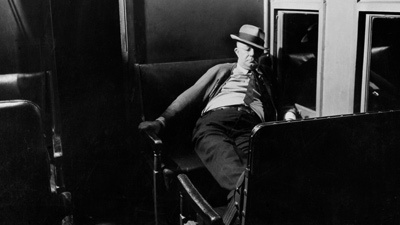 The cucumbers and Cherokee purple tomatoes were especially popular,” he says. Last year the prekindergarten kids set up a hallway market for parents. At end-of-day pickup time, the kids handed out kale and a recipe on how to prepare it. Bradley says her own preschool daughter learned to love kale after working with it. 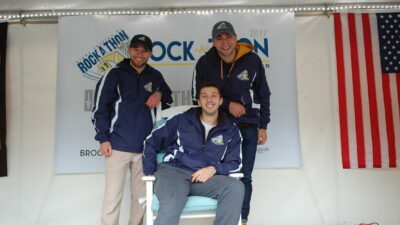 MU students have been involved from the beginning. Students in human development and family studies earn course credit for working with children in the garden and on cooking-based activities. They provide valuable learning experiences and help make the garden a beautiful and productive space. Children water newly planted seeds with brightly colored cans. 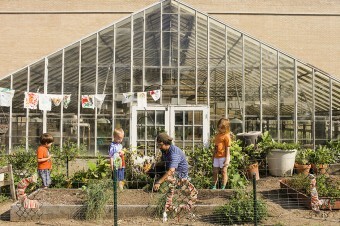 Because the CDL is a teaching and research lab as well as an educational setting for children, Bradley expects the gardening experience to attract student, faculty and staff research on health and nutrition. 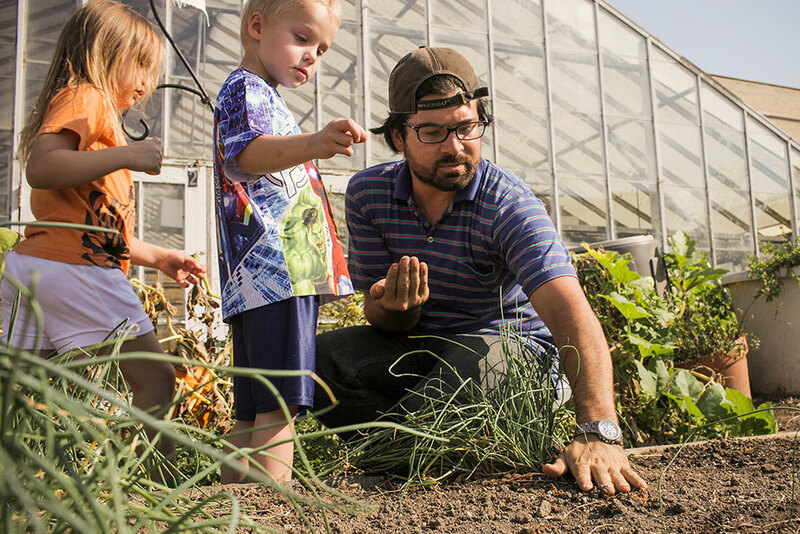 While incorporating the garden lessons into its preschool curriculum, CDL is teaching future teachers how to work with the initiatives and is moving toward making a broader impact by expanding its model of food and garden education through the region and state. “One of the stories we are trying to figure out how to tell through assessment and research is the connection the children have to the garden and their relationship with the plants and soil,” Murakami says. In conjunction with its focus on healthful eating for preschoolers, the learning center has reduced the amount of sugar and increased the use of whole grains and proteins in the children’s menus. The CDL has applied for and expects approval into the USDA Eat Smart Program, an initiative to improve menus in child care centers. The CDL participates as well in Taking Steps to Healthy Success, a Missouri Early Child Care and Education Learning Collaborative. 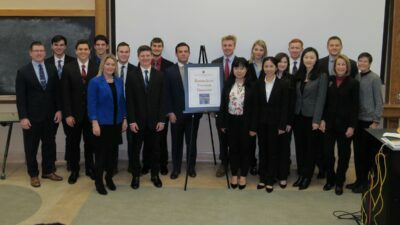 The effort supports creating healthful environments for children and families through such measures as reduced TV viewing and increased fruit and vegetable consumption. Meanwhile, the children are preparing to put their garden to sleep for winter by planting onions, garlic and potatoes at the end of the growing season.